﻿ How the hell do you... Pull a 209mph wheelie? The course is a mile long, on an airfield obviously, and in the last part of the mile is a measured kilometre. You need to be pulling a wheelie when you enter this kilometer and hold the front wheel in the air over the whole distance with your speed measured when you break the timing lights. My bike is a 540bhp turbo Suzuki Hayabusa with a Dymag carbon front wheel and a small GSX-R1000 top fairing. I’ve done previous attempts without a fairing but at 200mph you get terrible double vision due to the wind-blast. How the hell do you... set a world record jump? 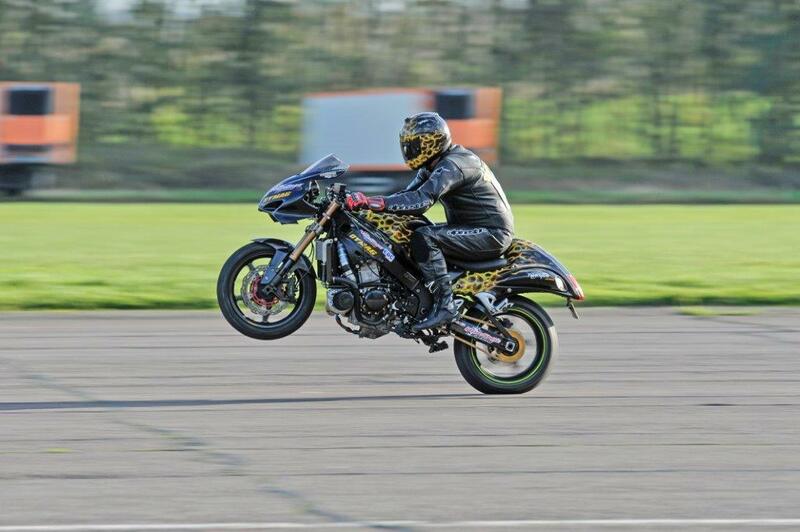 The wheelie part is quite easy, I lift the front in sixth gear at about 160mph by just giving it a squirt of throttle. You need to get the front just hovering above the ground, keeping it there by feathering the throttle. You aim to keep the front as low as possible as that means you can keep accelerating, if it gets too high you need to back off and you can’t build speed. It’s a fine balancing act. If there is a bit of side wind you can use your body to counteract it, but I’m basically just trying to accelerate as hard as possible. The major worry is when you land it as at 200mph the front wants to go into a massive tank slapper. I have set the record at 209.82mph, but I reckon 220mph is possible.